Janzen Ag Law has hit another milestone as we enter our third year. Every small business knows that each anniversary is special. As I reflect back on the past year, I keep thinking about what leadership really means. To celebrate this year's firm anniversary, I am dusting off one of my favorite blog posts from many years ago. I wrote this post after returning from West Africa with the Indiana Ag Leadership program in 2014. It is not enough to talk about peace. One must believe in it. And it isn’t enough to believe in it. One must work at it. Although I could tell from my photo that the quote was from "Roosevelt," I was surprised when learned the quote was from Eleanor Roosevelt. I thought, how perfect of a quote to summarize my thoughts after two years in the Indiana Ag Leadership program. Great leaders don't just talk. Great leaders lead by action. One of our assignments in the class was to write a leadership white paper discussing a leadership topic relevant to agriculture. I read the book The Worst Hard Time, which follows the struggles of various farm families in Kansas, Oklahoma, Texas and Colorado during the Dust Bowl. The 1930s were devastating to many farm families in the Great Plains. Many other people in the US thought the area should be abandoned and allowed to become another "Sahara desert." But instead, this was a time when great leaders rose to the challenge of saving the land. One of those great leaders was Hugh Bennett, who founded the Soil Conservation Service (now the National Resource Conservation Service (NRCS)). Bennett believed that through modified farming practices, hedge rows, and returning marginal land to pasture the area could not only be saved but also could thrive. His foresight and ideas proved correct, saving much of America's breadbasket from ruin. This example of government rising to meet unexpected challenges contrasts sharply with what our ag leadership class observed in Liberia, West Africa. Liberia is a country where the failure of leadership plummeted the country into years of civil war and instability. The result for agriculture--as well as the population--was devastating. Today, more than a decade after the civil war ended, the scars are still evident everywhere you look. Rice fields are vacant and raising livestock is all but forgotten. Water is still pumped by hand. Liberia is an example when leaders put their own self-interest in front of their citizens. Poor leadership destroys cultures and civilizations. Our time in Liberia coincided with the 100th birthday of Norman Borlaug. Dr. Borlaug is called the father of the Green Revolution and is credited with saving a billion lives over his lifetime. He pioneered advancements in wheat genetics and tirelessly promoted this and other modern technologies in corners of the world where agriculture struggled. He was awarded the Nobel Prize in 1970 for his efforts. Great leaders realize that it's not about them, it's about empowering the people around them. A leader by himself or herself can accomplish nothing. A leader must work to create positive influence--it cannot be forced upon others from the top down. The Eleanor Roosevelt quote above was something she said in 1951 during a radio broadcast of the Voice of America. The Marshall Plan was well underway. Her broadcast would have been heard by Americans working in Europe to rebuild the same cities the US had bombed only years earlier during World War II. Having recently been to Northern Europe and seen how prosperous it was--and contrasting that to warn-torn Liberia which has made little progress in rebuilding the country--I could only reflect on how much leadership and work it took to undertake the Marshall Plan. 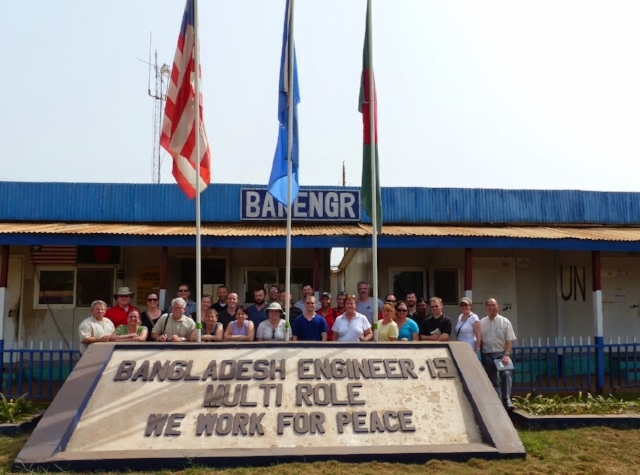 Similarly, that's why the UN peacekeeping force in Liberia was not just soldiers, but engineers. Leaders don't just talk. Leaders do.